A positive image is the goal of any uniform. Uniforms help to identify your school or company’s professionalism. They also help build teamwork and morale. Most importantly, a good uniform helps distinguish yourself from the competitors. St. Louis Sportswear offers numerous uniform lines and styles to help you build the right image. If you are looking for a polo, jumper, pair of shorts, or pants, we have plenty of options to choose from. Schools all over the St. Louis area have used brands like A+ School, French Toast, Gildan, and Jerzees to help facilitate their uniform programs. We offer great styles and brands to help outfit your staff, from the kitchen to the floor! Whether you are in need of: Aprons, Chef Hats, Chef Coats, Bus Coats, or Server’s Shirts, we can help. Brands like Dickies, Edwards Garment, and Chef Designs are always a great choice. If you are in need of HiRes work wear and Safety items we can help outfit you with the right styles. We offer ANSI/SEA compliant items from Starline and ML Kishigo. If you would like to pair those items with Safety Glasses, Hand Protection, Head Protection, or Ear Protection we can help you out with that as well. Whether you are looking for shorts, pants, work shirts, or heavy duty jackets, St. Louis Sportswear has plenty of choices to pick from. We can help outfit your staff with brands like Dickies, Carhart, CornerStone, and Red Kap. There are plenty of styles to help outfit any and all medical staffs. Check out our scrubs from Bio and Jockey. 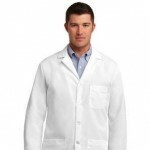 We also can provide Lab Coats from Meta Labwear. Don’t forget that we can get lanyards as well!